Today I was busy from 5AM until, well, right now. I had so much to do before I leave for Chicago in the morning, I wasn’t sure I would get it all finished. And, actually, I didn’t quite. I still have to get up early and go make copies of things for the substitute. I also need to finish filling out my student teachers’ evaluations, which will be easy because they are amazing this time around. Spiritually, I am not sure there is anything I can think of to write about. I prayed, I read, I loved, I ate, I celebrated life. Simple things I do each day. I did get a little crazy and eat ice cream for dinner. 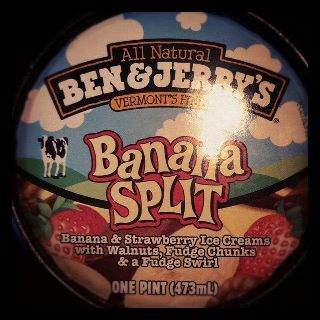 It was a toss up between this and Chunky Monkey. Almost everyone finds their early days in a community ideal. It all seems perfect. They feel they are surrounded by saints, heroes, or at the least, most exceptional -people who are everything they want to be themselves. And then comes the let-down. The greater their idealization of the community at the start, the greater the disenchantment. If -people manage to get through this second period, they come to a third phase — that of realism and of true commitment. They no longer see other members of the community as saints or devils, but as -people — each with a mixture of good and bad, darkness and light, each growing and each with their own hope. The community is neither heaven nor hell, but planted firmly on earth, and they are ready to walk in it, and with it. They accept the community and the other members as they are; they are confident that together they can grow towards something more beautiful. More than any other quote I’ve encountered, this one exemplifies my relationship with Burris Laboratory School. I am (finally) in the stage where I think I can recognize that my colleagues aren’t “saints or devils,” but I can see them as people who walk the earth much in the same way I do. I know Vanier’s thoughts were written/uttered about spiritual communities, but in many ways I need to see my workplace as a spiritual place, not in the creepy “I want God back in schools” kind of way, but in the way Matt talked about on Sunday. I have been placed by God at Burris and I need to put my whole heart into my work, which for me means I need to see the spiritual relevance of the place. And what is more spiritual than shaping and forming the intellectual development and curiosity of our fellow humans? Thinking in this fashion helps hold me much more accountable.